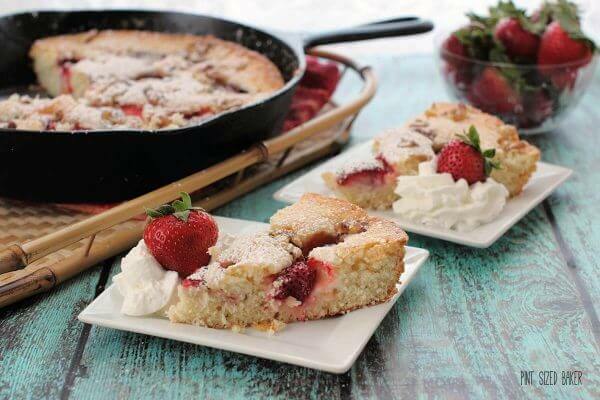 This Strawberry Buttermilk Skillet Cake recipe is simply amazing! It’s easy to make and it’s so delicious to serve to your friends and family – even on a weekday. Are you looking for a great cake to bring to a friend’s party, but you don’t want to slave away in the kitchen all day? Then I’ve got the BEST cake for you! 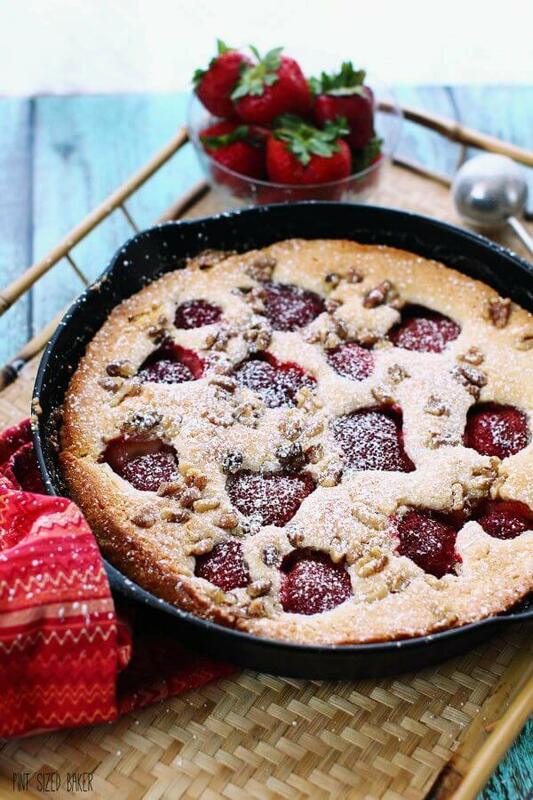 This Strawberry Buttermilk Skillet Cake is so beautiful that you won’t want any frosting to cover up the strawberries, nor does it need anything else to sweeten this dessert. 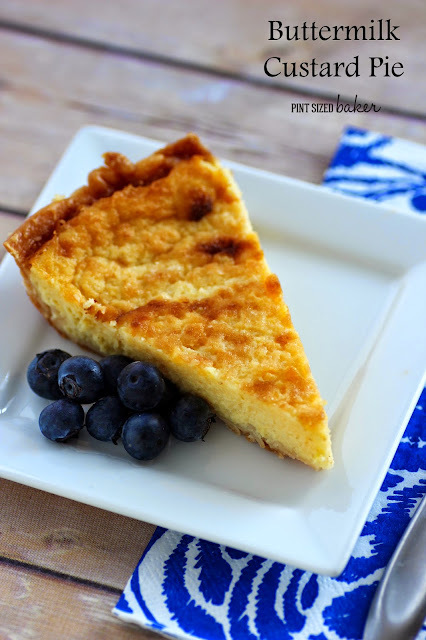 This skillet cake is a breeze to make and if you don’t have buttermilk on hand, don’t worry, I’ve got some tips to make some ASAP! Now that you KNOW you want to make this cake ASAP, here’s what you can do if you don’t have buttermilk in the fridge. #1 – Buy Powdered Buttermilk. This stuff keeps forever and it’s great when you get the urge to make buttermilk pancakes, waffles or a skillet cake. I use this brand that I bought at my grocery store. Bob’s Red Mill also has powdered buttermilk. #2 – Make your own. Buttermilk is “soured” milk and the quick way to turn your milk is with lemon juice. Add 1 Tablespoon of lemon juice for every cup of milk. So in this recipe, add 1/2 C milk and 1-1/2 teaspoons of lemon juice. You may taste some lemon in this cake and that’s not a bad thing. #3 – Add a Cream of Tartar as your acid. You’ll skip the lemon flavor but the cream of tartar will still give a slight tang to the cake. Mix 1 1/2 teaspoons of cream of tartar to your DRY ingredients for every cup of milk. In this recipe, add 3/4 teaspoon to the flour mixture, then add in your milk as directed. And there ya have it! 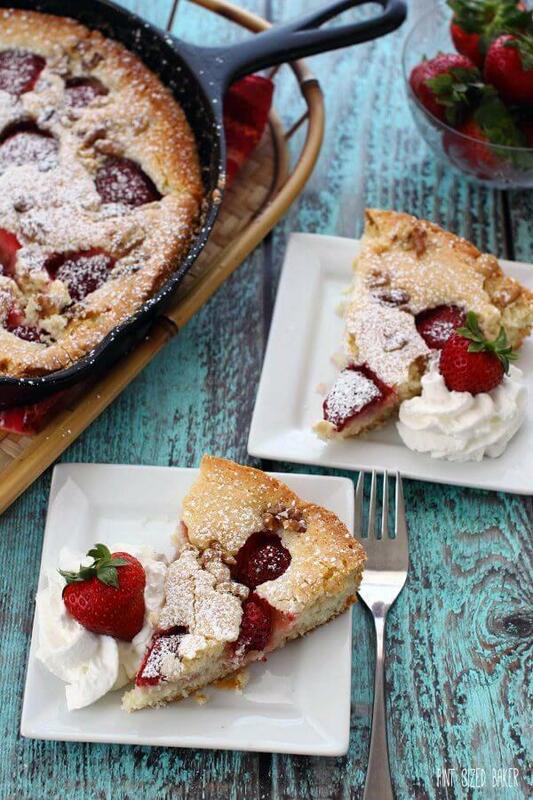 Quick and easy buttermilk cake studded with fresh strawberries. Everyone will love this cake and beg for a second slice. The skillet makes the edges a little crispy, but the center is soft and moist. 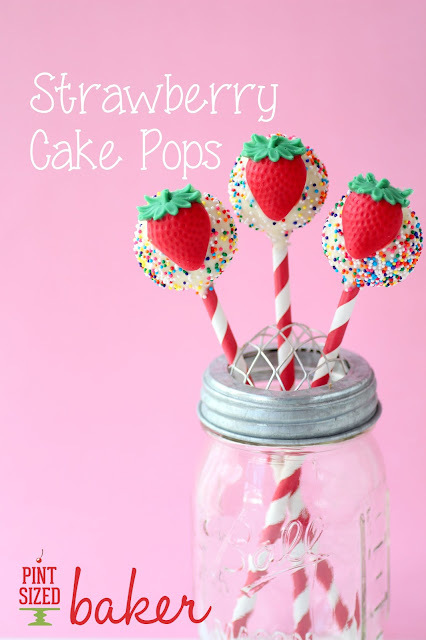 Serve it with some fresh whipped cream or even some ice cream. 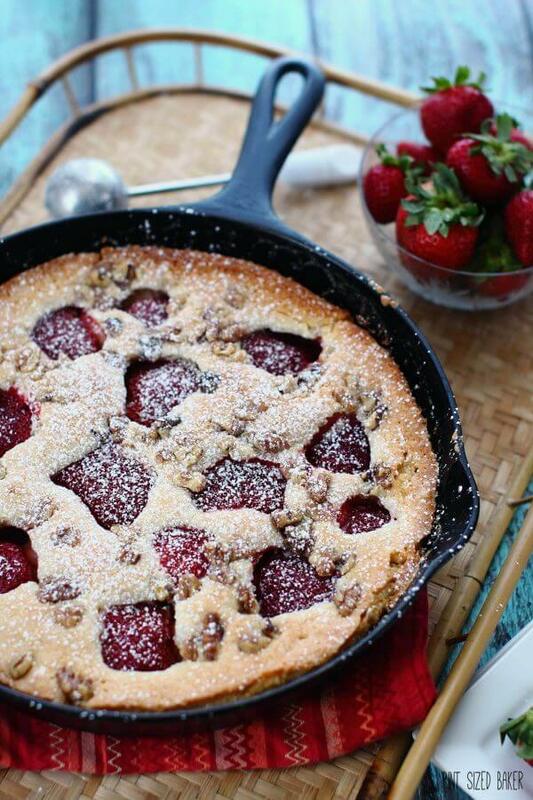 Do you love baking in a skillet? I’ve got a Giant Chocolate Chip Skillet Cookie you can make for dessert as well, but what about these dinner options?? Garlic Parmesan Skillet Rolls – Creamy Roasted Red Pepper Chicken Skillet – Tuscan White Bean Skillet. 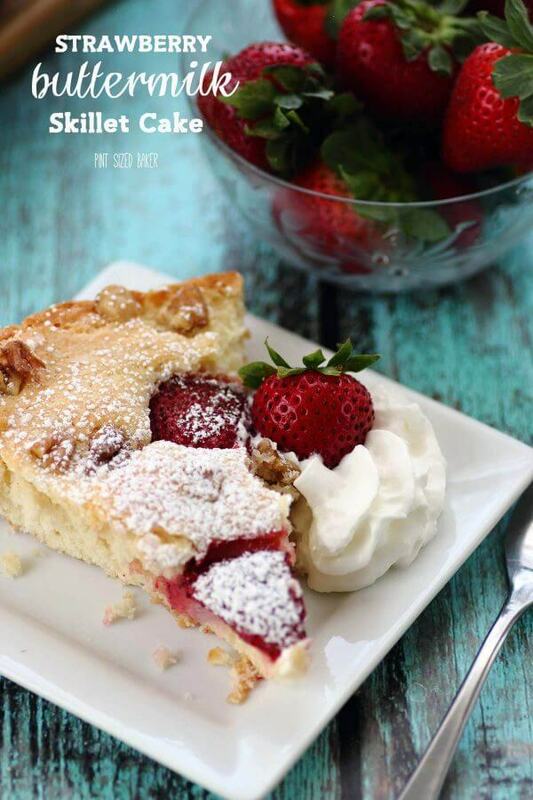 Quick and easy buttermilk cake studded with fresh strawberries. Everyone will love this cake and beg for a second slice. Preheat oven to 325F and spray a cast iron skillet with nonstick baking spray with flour. Beat the butter and sugar on medium speed until fluffy. Add egg and beat for 1 minute to incorporate. Add extracts. Sift together the flour, baking powder and salt then add ⅓ to the batter followed by half the buttermilk. Mix on low then add another ⅓ of the flour and remaining buttermilk. Mix on low and scrape the sides as necessary. Add the remaining flour and mix until just combined. Do not overbeat. 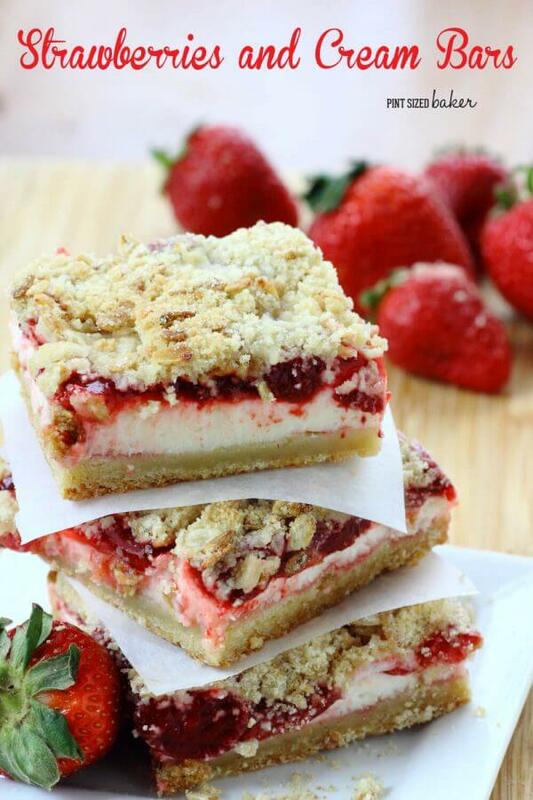 Spread the batter into the prepared skillet and place the sliced strawberry sliced cut side down into the batter. Sprinkle on the coarse sugar and nuts. Bake for 45 – 55 minutes and test with a toothpick for doneness. Cool completely for several hours before serving. Dust with powdered sugar. Here are a few more recipes you may enjoy!